In the evening Bhajans started at 5.15 p.m. Bhagawan went down to the darshan grounds granting drashan to the assembled devotees and proceeded to the place where a statue of Holy Mother was installed in His presence. After coming into the bhajan hall & blessing the assembly with darshan, then it was the turn of Mr. Ajit Poppat to address the gathering. 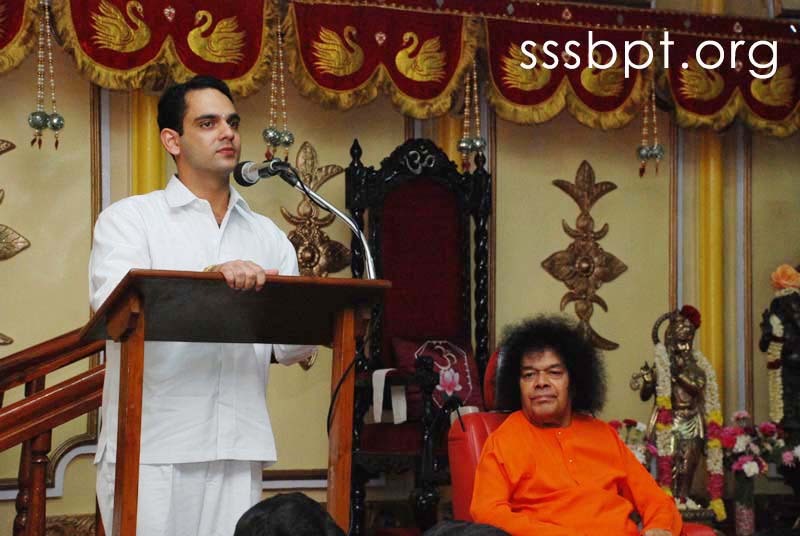 He commented on the auspiciousness of the day and proceeded to elaborate on the significance of the English Alphabets that can sum up Bhagawan’s teachings. ABC-Always be Careful; Always be cautious; Always be Compassionate….D - Devotion, Determination, Dedication, E - Enterprise, Energy; F - Follow the Master , Face the Devil and Finish the game; G – Be greatful; Be Godly; H – Happy, Healthy, Holy etc. 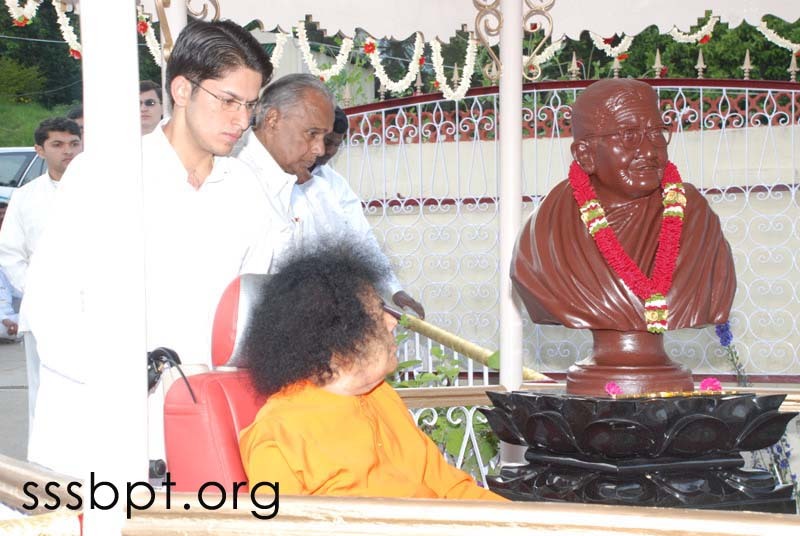 He emphasized to practice Bhagawan’s teachings; To bring transformation, watch Bhagawan’s action, gesture & word and make the most of the fortune of having darshan, receiving Prasad all of which bring intangible benefits , said the speaker. Remember that consistency, persistence and intensity in our practice would pay rich dividends in our Sadhana. Remember Him as every second of our lives as Karunamurthy, Premamurthy, kshamamurthy. He had said that His life is His message. If we but follow delightfully the path shown by Him our lives too would shine His message, said Mr. Poppat. 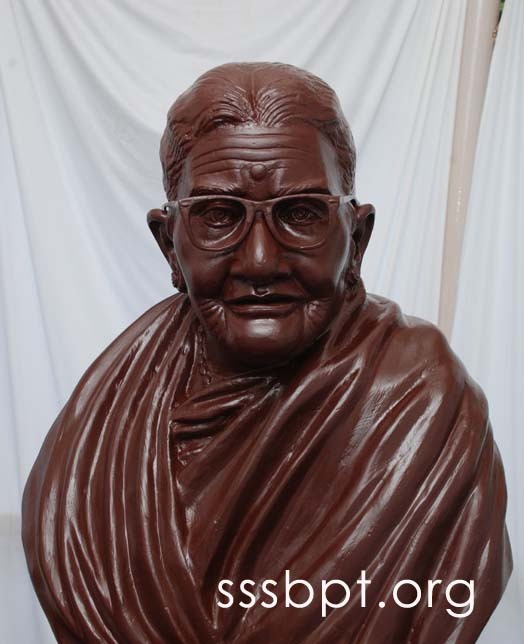 Sri V.Srinivasan, the All India president of SRI SATHYA SAI ORGANISATION announced that on this very auspicious day a statue of Mother Easwarama made of PANCHALOHA had been installed in the immediate presence of Bhagawan and that it faces the lake in the Easterly direction enabling the Sun God to have a darshan before starting on his movement. It is an occasion for rejoicing and celebration. 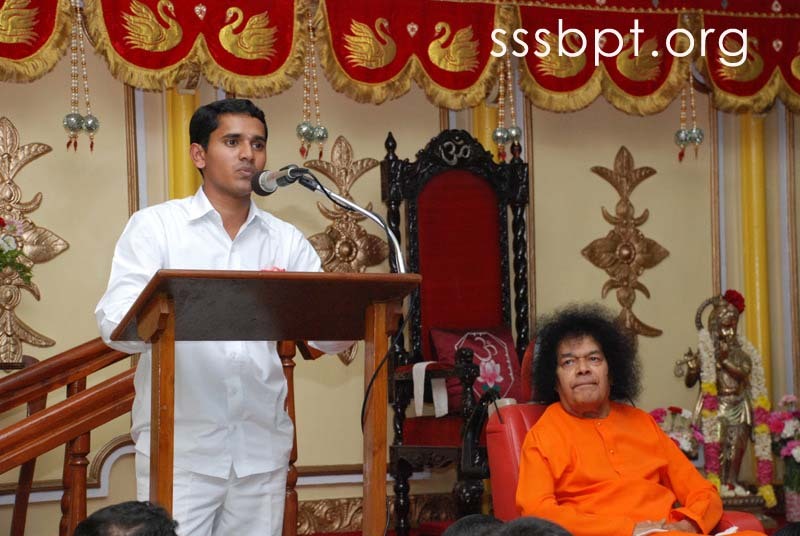 He then proceeded to introduce two Sai Student who where to speak .Bhagawan has been giving a holistic education that moulds the students and develops there innate talents like music, acting, speaking among others. They are great achievers in academics too that every student have holds 2 or 3 degrees. R. Siddrath hails from Chennai and has a degree in English and is an MBA. He is an actor and bhajan singer par excellence . He was followed by Sai Shyam Sharma who is an M.sc /M.Tech, having studied from the primary level, he has spent 19 years with Bhagawan. He is the University Brass Band Leader. Siddarth said that his heart was overflowing with love and gratitude & went on to sing the song Jagathodhdhahara, which ends in describing the Lord as present in the microcosm and macrocosm. Even the Vedas failed to describe God. 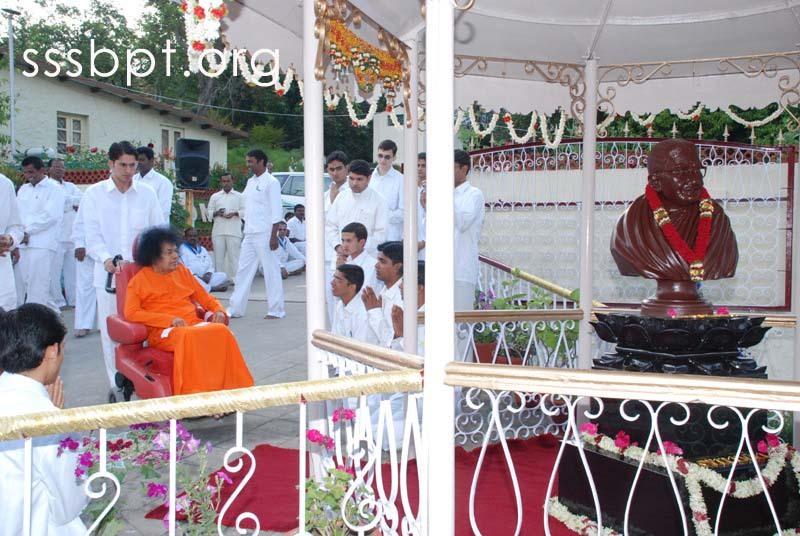 He proceeded to list some of the lessons he had learnt at the feet of Sai. He repeated the story of Krishna asking Narada as to who was the biggest and how everything He mentioned finally led to the Lord Himself. A devotee has to maintain equanimity at all times. As Shakespeare said “All the world’s a stage and we are mere players…”. God has written the script and we act accordingly but the mystery of this drama is that we do not know what comes next. Bhagawan who is ever giving and does not take anything in return once asked a devotee, namely, Mr.Sinclair only one thing in return and that was “BE HAPPY”, He asks for nothing else other than our happiness. Remembering that everything is done by Swami and we are mere puppets should make us smile all the time and offer our happiness to him. He proceeded to quote a tamil poem that says only by space we come to know Him and finally surrender to Him. 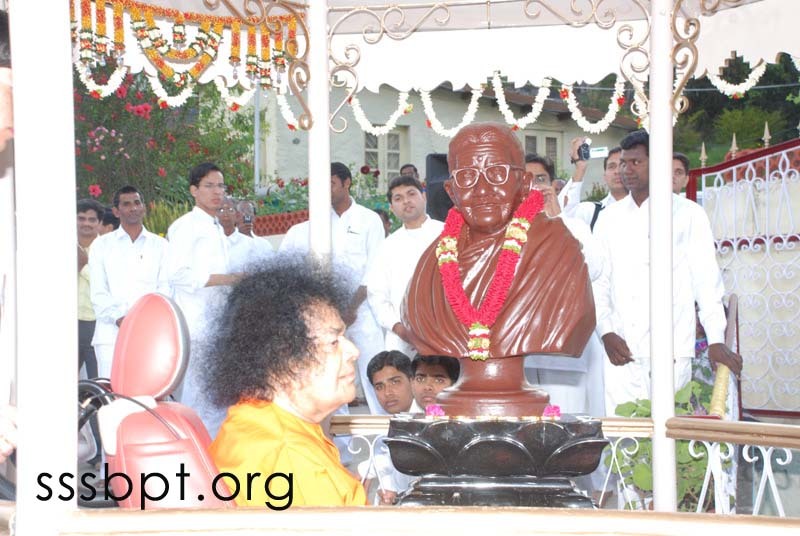 Sai Shyam Sharma began his speech by expressing his amazement at the number of devotees who come from all the countries in the far corners of the world but swami has not physically gone there. It is His Divine love and Supreme powers that has drawn & continues to draw them. Bhagawan is unique. He is friend, father, Brother…..Shyam Sharma recalled how in 1992-93 ,he was studying in the 2nd standard and his shaky milk tooth was pulled out by a classmate. At darshan time swami noticed the gap in the front teeth & teased that Maruthi car can fit into it. Immediately one would imagine a Maruti car but lord Sai Rama explained that Maruthi is another name for Hanuman. Swami is a teacher always. Very few people could bind themselves to Rama or Krishna but Sai devotees, though far far away are bound to Swami. The whole world is His family. He proceeded to recall another incident when he received punishment for not doing his home work. He sulked and skipped lunch & shifting at darshan thought nobody cares whether he ate or not. Bhagawan came out after interview & walked up to him to ask what he had for lounch. He kept quiet not knowing what to say and the boys next to him said dal & swami father gestured “what Dal “? He realized that Swami was his friend , and that he was there for him always. In 1994 his parents came to swami &his mother who was suffering with intestinal cancer told him that their children belong to Him, since she did not know how long she would live. Swami promised to take charge of them and has been helping ever since. Sister’s marriage was performed by His grace. For his brother studying for the exam in chadigarh , swami directed him in a dream to study certain pages and 80% of the questions came from those pages!!. Swami never leaves us. He sang the song Humko Thumse…and all joined in singing “WE LOVE YOU” and ended with the declaration that there is only one bandham which is prema bandham. He recited a poem to say how he felt when Swami patted his cheek even before he knew Him as God. Sri V.Srinivasan commented that we all have learnt lesson of love from our brother. He pointed out how so many of them had 2-3 degress but do not want to leave Swami. They want only to continue to stay with him. There is a boy who plays on the tabla who hails from Spain. 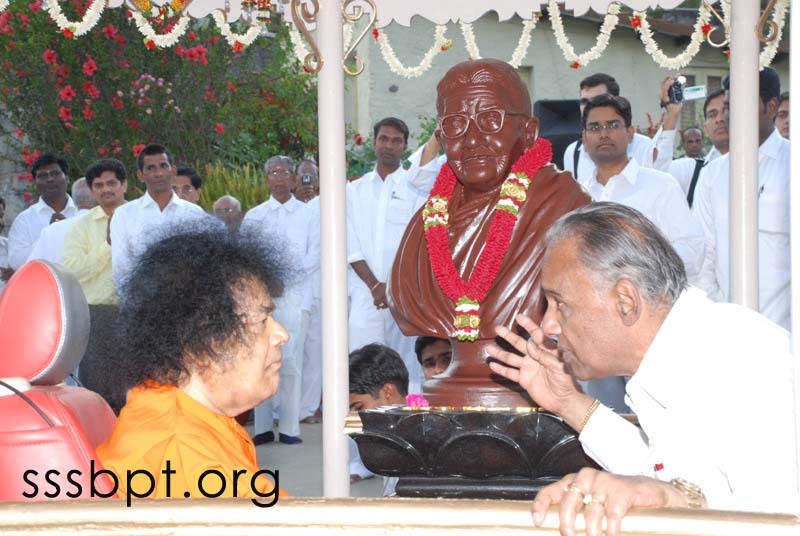 Bhagawan is the most powerful magnet .Swami then directed them to sing a Meera Katha . The students sang a song on Mother Easwaramma describing her as “RATNAKARA VAMSA RAJAMATHA”. The boys ended with a QAWWALI that says life without you is empty ,you are our heart beat, you are jeevan WE LOVE YOU. Mangala Aarthi was offered at 7.16 p.m.